Job Summary: Management Trainee is an entry level position for talented, highly motivated and qualified young people to be developed on a career path in the management cadre. Upon successful completion of one year of training and development they will be eligible for confirmation in Officer (O1) Level. 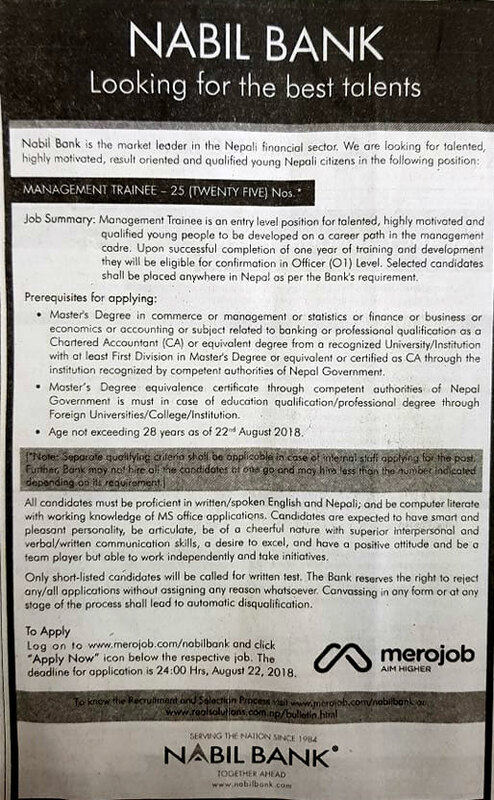 Selected candidates shall be placed anywhere in Nepal as per the Bank's requirement. > Master's Degree in commerce or management or statistics or finance or business or economics or accounting or subject related to banking or professional qualification as a Chartered Accountant (CA) or equivalent degree from a recognized University/Institution with at least First Division in Master's Degree or equivalent or certified as CA through the institution recognized by competent authorities of Nepal Government. > Master’s Degree and equivalence certificate through competent authorities of Nepal Government is must in case of education qualification/professional degree through Foreign Universities/College/Institution. All candidates must be proficient in written/spoken English and Nepali; and be computer literate with working knowledge of MS office applications. Candidates are expected to have smart and pleasant personality, be articulate, be of a cheerful nature with superior interpersonal and verbal/written communication skills, a desire to excel, and have a positive attitude and be a team player but able to work independently and take initiatives. Only short-listed candidates will be called for written test. The Bank reserves the right to reject any/all applications without assigning any reason whatsoever. Canvassing in any form or at any stage of the process shall lead to automatic disqualification.